Removable neck cover included, knitted polyester, ultra breathable, patented front & back leg arches. Removable hood included, soft knitted polyester, patented front leg arches & two criss-cross surcingles. Soft knitted polyester, patented front Leg Arches for freedom of movement & 2 criss-cross belly surcingles. 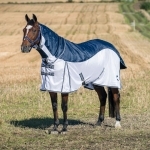 Flysheet with attached hood, soft knitted polyester, front Leg Arches for freedom of movement. 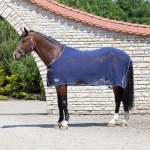 Removable hood included, specially cut for the pony body, soft knitted polyester, front Leg Arches. 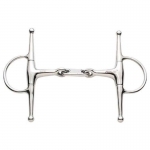 Designed for the fuller shoulder and hip of stock horses and is cut in 2” increments to ensure the perfect fit. 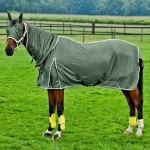 A multifunctional blanket, that can be used against flies, after riding, or as a cooling blanket by soaking it in water. Sheet is made from a super soft, coated nylon micro mesh that blocks 70% of the sun's damaging rays. Carefully placed fitting darts and an adjustable neck line allows you to adjust the sheet for the proper fit. 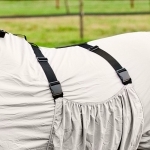 Extremely lightweight and comfortable without sacrificing durability, your horse stays cool. The Crusader Bug Armor Belly Guard is made from a light-weight, soft mesh designed to shield your horse from flying irritants on the trail or in the practice pen. Infused with EPA approved insect repellent, will repel fleas, flies, ticks & mosquitoes up to 2 yrs. Waterproof back, combo neck with velcro closure, detachable leg straps and gusset. High neck attaches to the halter, gusset gives more freedom to move, and releases pressure on the shoulder points. It covers the entire body except the legs, easily hose the dirt off and air dry. Hood sold separately. 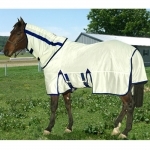 Keep your horse warm and dry with this stylish sheet, look for matching mask & boots. © 2008 The Original Horse Tack Company, All Rights Reserved.